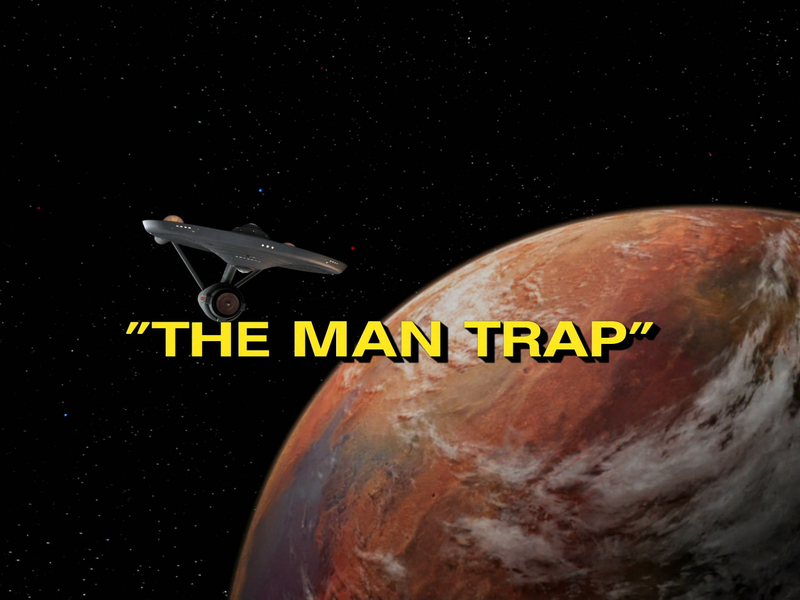 The Weekly Blargh: TOS Season 1: Episode 2 - "The Man Trap"
TOS Season 1: Episode 2 - "The Man Trap"
Hooray! The main crew! In bits and pieces. And look at Kirk swagger! You can definitely tell that this episode is not the first episode pilot though as there's no introduction at all. Just Kirk and Bones on a planet getting some Bones backstory oddly enough. So far though it seems every episode of Star Trek will be about men in space overcoming the wily ways of women. Just like the Pilot we have an alien who appears to our character as young and beautiful, but its just an illusion. Apparently you just can't trust your eyes in space. Either that or Gene Rodenberry had a mind control fetish of some sort. I like that I'm getting to see Bones + Kirk off the bat because I'm not as familiar with that dynamic as much as I am with the Spock + Kirk friendship that develops. There are some really weird close ups of Kirk's sweaty face though... like someone sprayed his face with misting machine. Also the way the scenes are setup and framed are weird sometimes. Back and forth conversations are obviously shot at different times, the body posture is all wrong. Kirk is standing straight in half the conversation and all angry and hunched in the other half. Also are Spock and Uhura flirting in their first scene? I guess that's where the rebooted movie got it from. It seemed shocking when the movie came out that they'd rewrite the character histories that way.... but I can see that rooted here. I really like the scene in sickbay where Bones is talking about how his old fling looked like she did 10 years ago to his buddy Kirk, but Kirk gets all business on him. There's a distinct back and forth about personal and business talk. Sometimes it's inappropriate to be so friendly when someone has died. They quickly get back to business and apologies ensue. It feels very real to me. Okay, so transporter question... Wouldn't the transporter be able to know the difference between the salt alien and the dead crew member Green? Seems like you'd need to know the entire molecular structure of someone to transport them. Oh well, whatdya gonna do? So the salt monster's powers kind of confuse me. At the beginning of the episode, it appeared as different appearances to different people at the same time. Later it is implied that it is more of a shape shifter. It also somehow learned Swahili all of a sudden when speaking to Uhura, so it seems it has mind reading capabilities. But then its like super awkward when acting as that dead yellow shirt kid. I guess when it gets hungry, it gets stupid. A face only Bones could love? 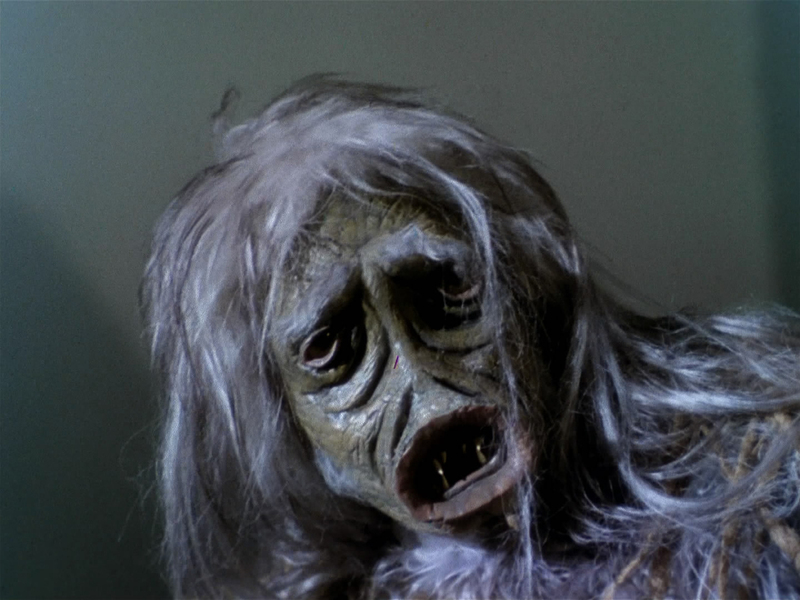 Kirk and Spock's standoff with the creature's husband was kind of fun. It ended with another diatribe about how the salt creature is like the American Buffalo. So some political commentary shoehorned in. So... in the end it comes down to Truth Serum threat to expose the beast? And then it kills the one person trying to help it? How very odd a resolution. Is truth serum even a thing in the Trek universe? Also Bones was acting like a complete fool. I don't think the beast has mind control, but it took way to long for him to shoot the beast. Don't give me crap about the beast looking like his old girlfriend either cause it isn't helpful. In any case, it took the beast literally killing Captain Kirk to snap him out of it. Commemorate this episode with this weird limited edition Hallmark ornament! More casual sexism. "Wouldn't you like her as your own personal yeoman?" As Yeoman Rand walks by. Now, one could argue that she likes the attention as her skirt is much shorter than everyone elses, and I did spot some ladies wearing black pants with their uniforms, so its not like they are standard issue, but that's not fair. Men, control yourselves. "Stop thinking with your glands!" - Kirk to Bones... lol.